Werewolves howling for lost love and regret, robots enslaving and destroying humanity, lost love returning in the zombiepocalypse, and that's just the first three songs! Geeky goodness. Band and chorus geek, theatre geek, computer geek, D&D Geek, computer gamer geek, the list goes on. This album makes use of all that geeky-ness and wraps most of his geekiest songs in one neat package. Zombies and werewolves and Second Life®, oh my! The album opens with the complaints of a werewolf about to turn, longing for the time when he didn't turn into a beast once a month. It then runs headlong into the Zombiepocalypse with a tale of boy meets girl, gets her to marry him, loses her to tragic accident, but then gets her back in the zombiepocalypse. Good fun (and brains). Then, if zombies weren't enough we get robots enslaving and then destroying humanity. All in good fun of course. 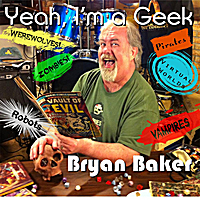 "That guy is awesome, he makes silly and articulate nerd music about werewolves and zombies and stuff. " - Heather LeStabbityDeath on her blog "Let the Blood and Whiskey Flow"